Mr. Haley is a veteran Force Reconnaissance Marine with 15 years of dedicated real world experience including: combat tours in Middle East, Africa and Central Asia. After leaving the military, Mr Haley served as a special operations and security contractor before partnering with Magpul as founder and CEO of their training division, Magpul Dynamics. Mr. Vogel was born and raised on a farm in rural Ohio and was brought up to have a healthy respect for hard work and discipline. From a very young age shooting and hunting also became a big part of his life. Always being somewhat of a thrill-seeker, the Law Enforcement profession sparked his interest while in high school. After graduation he went immediately into a 2 year Police Academy Program. He excelled at this and graduated as valedictorian of his class. It was while Robert was in the Academy that he began shooting competitively in IDPA. Since finishing 1st out of 19 shooters at his first ever pistol match in September of 2001 he has never looked back. At present Robert is a 2-time World and 13-time US National Champion across 3 separate shooting disciplines. He holds the distinction of being the only Law Enforcement Officer of any kind to have achieved much of what he has in the practical shooting realm. 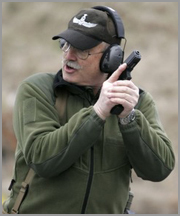 Mr Spaulding is a professional firearms instructor with 36 years experience in Law Enforcement and Federal Security. The recipient of the 2010 Law Enforcement Trainer of the Year Award from the International Law Enforcement Training and Educators Association (ILEETA) and Law Officer Magazine, Dave has graduated from many of the most prestigious LE and firearms training programs and has trained students from across the globe in realistic combat handgun techniques. He worked in all facets of law enforcement including communications, corrections, court security, patrol, evidence collection, training and investigations. He was a founding member of his agency’s SWAT Team and acted as its training officer for 8 years. He spent a year in an undercover capacity and was the commander of a multi-jurisdictional narcotics task force that literally worked cases from Miami to Seattle. He has been an adjunct instructor at the former Heckler & Koch International Training Division and the Tactical Defense Institute. In addition to his many published articles (over 1,000), Dave is the author of two acclaimed books, Defensive Living and Handgun Combatives. He currently operates his own training company that focuses exclusively on “the combative application of the handgun” www.handguncombatives.com. Mr. Hackathorn has served as a US Army Special Forces Small Arms Instructor, Gunsite Instructor, and NRA Police Firearms Instructor. He is currently an FBI Certified Firearms Instructor, Certified Deputy Sheriff with Washington County SO, Ohio, and a SRT member and Special Response Team trainer. Ken has trained US Military Special Operations forces, Marine FAST and SOTG units and is a contract small arms trainer to FBI SWAT and HRT. Ken has provided training to Federal, State, and local law enforcement agencies and been active in small arms training for the past 25 years. He has written firearms related material for Guns & Ammo, Combat Handguns, Soldier Of Fortune, and currently American Handgunner and contributed to at least six other gun/shooting journals. Ken was also a founding member of IPSC and the IDPA. Mr. Harrington retired after 23 years of military service in 2003. He spent the last 16 years of his military career as a member of the U.S. Army Special Forces. Dave’s involvement in anti/counter terrorist training and operations forms the basis of his knowledge and experience in the tactical application of firearms. His expertise allowed him to serve two tours at the U.S. Army John F. Kennedy Special Warfare Center at Ft. Bragg, NC as a Special Operations Instructor for combat weaponcraft, military operations in urban terrain, and focal point close quarters battle (C.Q.B.). Dave has firearms instructor certifications fromt he FBIT, Secret Service, NRA and actively competes in both IPSC and IDPA with master qualifications from both. Dave is the founder and president of Martial Gun Incorporated(MGI). MGI’s training programs are structured for intermediate and advanced level shooters to refine their technical proficiency in getting the pistol into actions, keeping it in action, and getting it back into action as circumstances require. Mr. Wright is currently employed as a Master Firearms Instructor for G4S International Training Inc. Brandon is also a certified Department of Criminal Justice Service (DCJS) and NRA Tactical Shooting Instructor. He also serves as a volunteer academy staff instructor, under the Tactical Operations Unit, for the Virginia State Police. As Team Captain for Team ITI, he has reached amongst the highest level of classifications in the competitive shooting arena. A “Grand Master” in USPSA, a “Distinguished Master” in IDPA, Brandon currently holds (3) National Titles and has won several State and Regional matches. With ten years as a full time professional Firearms Instructor, Brandon is able to draw from his real world experiences as a State Trooper as well as his achievements in the competition world, to provide leading-edge training to Military, Law Enforcement, and Civilians.